FIG Commission 3 was particularly honored to organize its Annual Workshop in Iasi, Romanian city candidate as the European Capital of Culture for the year 2021. Iasi, an important and friendly city, was also chosen for its architectural beauty that “charms the eye and seduces the heart”, particularly by visiting the places of Orthodox worship. In this context the Workshop "From Volume to Quality: Bridging the Gap for Spatial Data Infrastructure" (3-7 November 2016)was organized . 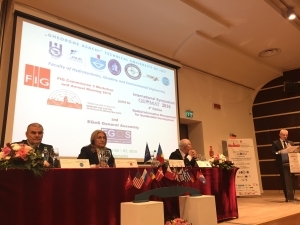 The workshop was organized jointly with the International Symposium Geomat 2016 and with the EGoS General Assembly by the Department of Surveying and Cadastre, Faculty of Hydrotechnics, Geodesy and Environmental Engineering from Technical University of Iasi and co-organized by the Romanian Association of Romanian Surveyors. At the Joint Opening Ceremony of FIG Commission 3 WorkShop and of the International Symposium “GEOMAT” the following authorities were present: the Vice Ministry of Finances of Romania; Prof. Florian Stătescu - the Dean of Faculty of Hydrotechnics, Geodesy and Environmental Engineering; Mihai Busuioc - the Gen. Secretary MDRAP (Ministry of Regional Development and Public Administration); Radu Codruț Ștefănescu - President General Director of ANCPI (National Agency for Cadastre and Land Registry, Romania); the President of INIS Board for Romania; Maricel Popa - President of IASI County Council; Marian Grigoraș – Prefect’s Institution of Iasi County; Mihai Chirica - Mayor of IASI CITY; Prof. Dan Cașcaval - Rector of “Gheorghe Asachi” Technical University of Iasi; Prof. Cornel Păunescu - President Romanian Association of Surveyors; Chryssy Potsiou, - President of the International Federation of Surveyors; Nikolaos Zacharias - President of EGoS (European Group of Surveyors); Vasile Chiriac - Secretary General of CLGE (Council of European Geodetic Surveyors). The workshop was an opportunity for delegates and partners to present their research and experiences in the field of development and use of VGI, GIS systems and SIM and SDI procedures. The program included three days of technical sessions with a wide variety of presentations focusing on the latest news and was a good opportunity to meet colleagues and exchange knowledge in the field of satellite tracking and of Spatial Information Management. The workshop aimed to focus on the role of Geographic Information Systems in relation to the correct forms of managing spatial data over the Internet. The gap is resulting from processing of large volumes of spatial data (quantity) in the informatics environment, often uncontrollable, and thus must be filled by an appropriate approach to ensure to users the reliability of information and to prevent incorrect decisions. The exchange of knowledge between the various members will also facilitate the synergy between public administrations that fulfill specific activities on the territory: from urbanism to spatial planning, from the environment to civil defense, from roads to construction, from agriculture to forestry, from tourism to culture. This workshop explored ideas and methods on how we can engage citizens through crowdsourcing within reliable new models of collaboration. The delegates of Commission 3 who were present in Iasi were about 30 while participants in the International Symposium Geomat were about 200. Participants included professionals, cadastral managers, university teachers and young surveyors. 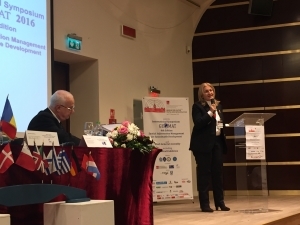 The President of FIG, Chryssy Potsiou, presented the current initiatives of FIG Council, focusing on the politics about how involving more and more delegates representing the members associations, the task Forces and the different Networks. 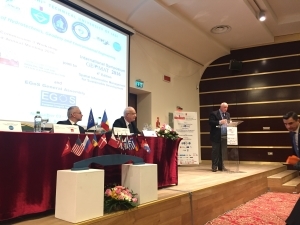 The Secretary General of CLGE and the President of EGoS were present in all sessions of Commission 3 Workshop and International Symposiun together with the representatives from Germany, Greece, Italy, Moldova, Romania, Israel, UK, Malta, ecc. On Saturday morning the EGoS GA took place. The program of Commission 3 included 7 technical sessions with a total of 20 papers, all about the topic of the Workshop and of Commission 3. As it usually happens during the FIG Commission Annual Meetings and Workshops, during the Closing Ceremonies there is the proclamation of the Best Paper. This year in Iasi as Best Paper was elected “ Rectilinear Approach to 3D Generalization of Building Models” by Alexey NOSKOV and Yerach DOYTSHER (Israel). Hereto, the paper written by Cromwell MANALOTO, Daniele BRANCATO, Alessandro DALMASSO, Luca DAL BUONO, Angelo CRESCENZI, Italy: Project BDI: the Socioeconomic Impact of Comparable Property Analysis through GIS was seceted as FIG Article of the month for December 2016. The initiative to organize Commission 3 Workshop joint with other events of high scientific and professional interest was very successfull cause it attracted the participation of all representatives within the field of Spatial Information Management. 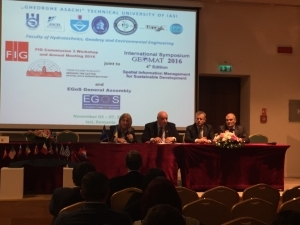 Management of spatial information for a sustainable development” was the topic proposed by GEOMAT – 2016 for all over 250 participants. 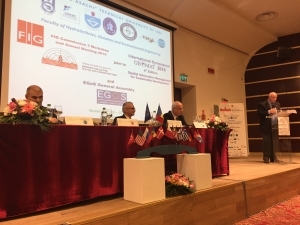 GEOMAT is an international annual event, being at its fourth edition, organized by Faculty for Hidrotechnics and Geodesy and Environmental Engineering, Technical University of Iasi in cooperation with Romanian Surevyors’ Union(UGR) and National Agency for Cadastre and Land Registration(ANCPI). The symposium was opened by exhbition of modern technologies in surveying and geospatial information processing and management where romanian private sector companies could present their new services and latest solutions for the local market with special participatioon of Mr. Valeriu Manolache – President of Private Surveyor Association and Prof. Cornel Paunescu President of Romanian Surveyors’ Union. The national event has offered a proper frame for discussions pannels and debates about surveyors’ role and their contribution form technical and legal perspective within the National Programem for Cadastre and Land Registration with outstanding participation of the ANCPI representants, Ileana Sprioiu - Deputee General Director and Victor Grigorescu Director of Systematic Land Registration Departament. The debates have been highlighted the significance for the completion of the countrywide systematic land registration in Romania in line with national strategy and EU cooperation partnership agreement. The changes in legislation related to land administration are much faster under pressure of citizens and society that becomes more open and oriented to social media than it use to be before, due to EU regulations compliance and as well as to the technology that it is upgrading faster than before too. Public institutions requires a new approach in relation with society where collaboration has to take the leading role in place of mutual information exchange. 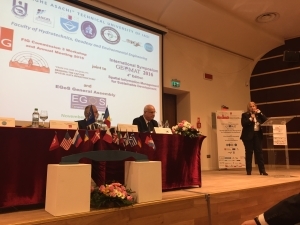 Academic and private sector participants have had the chance to discuss and debate in a separate pannel leaded by Vice Dean of the Faculty for Hidrotechnics and Geodesy and Environmental Engineering Assoc. Professor Constantin Bofu about possible ways and means for further cooperation when talking about future of the profession. The debates along the frame of National Porgram for systematic cadastre and land regitration revealed important institutional challanges and possible technical approaches that could contribute to faster and more reliable achivments of the objectives. During the symposium days, within technical sessions, participans have been included in their over 40 presentations discussions topics related to latest developments within sptial information management but also within other fields of interest as such geodesy and positioning, land surveying, mapping, modelling, and GIS, photogrammetry, engineering surveying, land administration and land valuation. Joining GEOMAT with FIG Commision 3 activities in Iasi has been an excellent chance for increasing the international participation and this fact has helped every participant to exchange and enhance their experiences enableing all people to exchange new ideas and initiating new common projects. All these will help the development of the geodetic profession role in the society.